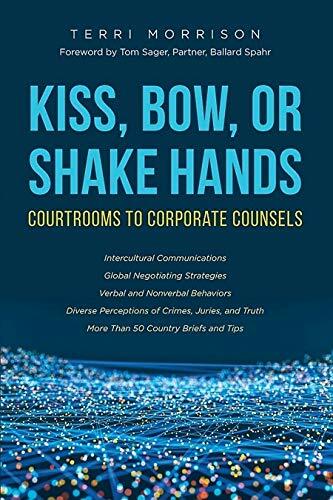 Kiss, Bow, or Shake Hands: Courtrooms to Corporate Counsels (English Edition) de Terri Morrison está disponible para descargar en formato PDF y EPUB. Aquí puedes acceder a millones de libros. Todos los libros disponibles para leer en línea y descargar sin necesidad de pagar más. •Your Asian client inadvertently blurts out a grotesque insult on the stand. •Hispanics on your jury start laughing at your body language. •A Russian negotiator seems to be lying right to your face. •A Japanese executive prefers jail time rather than tell you the truth. •A new French client questions your reasoning, rejects your advice, and debates your decisions. •A prospective client will not shake your hand. •Why do these things happen? Because people are not alike. Diverse languages, belief systems, business practices and traditions can make intercultural communications exceptionally complex. Sometimes, negotiations can break down over something as innocuous as whether you should interrupt someone, or sit silently and listen, or wait until you’ve had a meal together to discuss business at all. The field of law is increasingly competitive. You require accurate intercultural research to help you succeed with diverse clients domestically – as well as with international prospects both in person and virtually. Kiss, Bow, or Shake Hands®: Courtrooms to Corporate Counsels has the right data – written with lawyers for lawyers – by the author whose books have sold 450,000 copies, and INC Magazine placed on its “7 Best Books on Negotiation” list. Terri Morrison’s books have sold over 450,000 copies and have been translated into multiple languages—from Mandarin and Russian to Korean and Estonian. Knowledge is power. That is why Kiss, Bow, or Shake Hands is given to new hires at firms like Ernst & Young, Glatfelter, and Lockheed-Martin—and is recommended reading at NASA, the US Department of Defense, and the State Department. Kiss, Bow, or Shake Hands is one of INC. magazine’s “7 Best Books on How to Negotiate” and is also a Library Journal and Business Week “Best Business Book.” She is honored to be published by the American Bar Association. Her keynotes in intercultural communications, negotiations, global marketing and sales, diversity and inclusion, leadership, and globalization are informative and engaging. Seminar clients include multinationals like Accenture, American Airlines, American Express, ARI Fleet, AT&T, BAE, Boeing, Campbell’s, Cisco, Deloitte-Touche, DuPont, Ernst & Young, Federal Express, Franklin Templeton, HP, IBM, ILHM, Kronos, Marriott, Microsoft, NATO, Orbitz, Pepsi, and UTC; many associations, including the AICPA, AREAA, IFA, NAR, NBAA; World Trade Associations; universities like the Wharton School of the University of Pennsylvania, Cornell, and Villanova; and legal organizations like the ABA, DRI the Voice of the Bar, the Minority Corporate Counsel Association, the Philadelphia Bar Association, and TAGLaw. She has appeared on CNN, CNBC, Bloomberg, and repeatedly on NPR and the BBC. She has been quoted in the Wall Street Journal, Asia Times, Investor’s Weekly, National Geographic Adventure, ESPN, Fortune, and more. She lives near Philadelphia, Pennsylvania, USA, and serves on several boards.